Choose the correct wrap(s) for yourself! 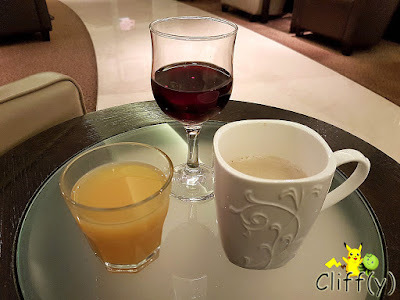 Having read many reviews online about how good Dilmun Lounge at Bahrain International Airport is, my BFF and I'd planned to go to the airport early to give it a shot using our Priority Pass membership cards. Once we were done walking around the transit area, we immediately went to the lounge have a proper dinner. 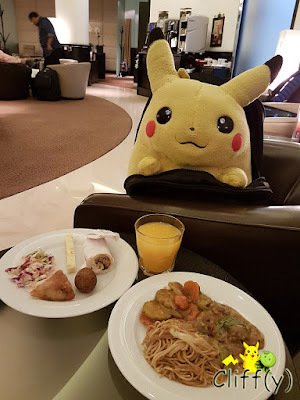 Would you like to dine together with Pikachu? 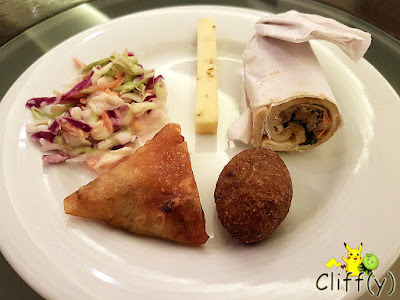 I found the coleslaw to be adequately sweet and crunchy, while the deep-fried items were warm and somewhat crispy. I recall seeing a few varieties of wraps offered, and I happened to take the one filled with chicken liver. Yuck! How unlucky I was! My BFF was delighted when he saw stir-fried noodle on the buffet line, which turned out to be pretty moist, but not particularly full of flavours. 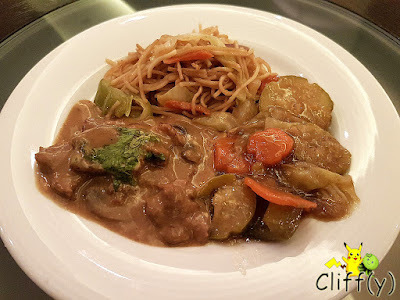 The beef slices with brown gravy were tasty, while the vegetable ragout was a tad overcooked. The cakes were moist, except for the triangular one that was really dry, while the round ginger cookie went well with latte macchiato (see below). I was prepared that the pistachio pastry would be really sweet, but it wasn't overly so. The fruits had hits and misses. 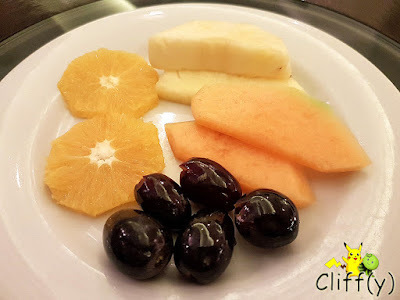 While the grapes were luscious and the cantaloupe slices were truly sweet, the orange slices were overripe and the pineapple slices were pretty dry. I took a bit of the red wine from Beaujolais Wine Region with its crisp acidity that reminded me of the time when I was there. Besides that, I shared a glass of pulpy orange juice and another of latte macchiato, which was creamy enough. 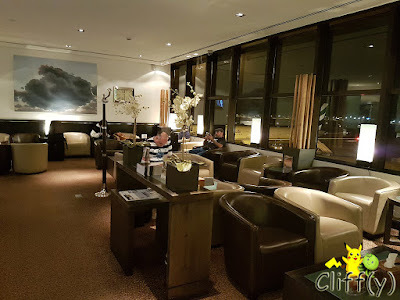 There were a lot of people at the lounge, but I still felt relaxed most of the time. I was impressed by the fact that the staff replenished the food promptly and ensured that the whole place was neat and clean. 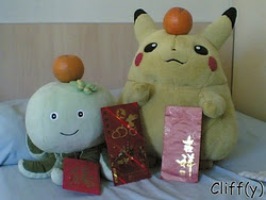 Pika's advice: The lounge is vegetarian friendly. 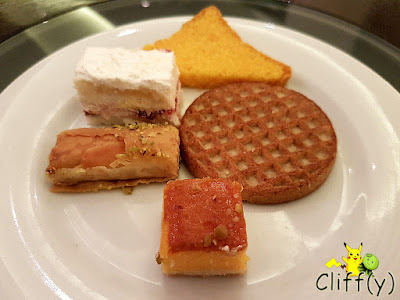 In fact, some of the food items looked fresher on the vegetarian buffet line that evening. *No separate price given as lounge access is included under Priority Pass.